My husband read this trilogy years ago and kept saying: "You have to read it, you're going to love it". So, when he challenged me to read The Thrawn Trilogy sometime during this year, I accepted. Five years after the Rebels defeated the Empire, Han Solo and Leia Organa Solo are married and expecting twins. Luke Skywalker is a Jedi, and trying to teach his sister the way of the Force. But he's plagued with doubts and goes looking for answers in Dagobah, where he finds more than he expected. The New Republic is a little shaky, and tensions are running high as they try to expand to other places. And in the shadows of all this, a new Admiral is rebuilding the Empire. General Admiral Thrawn is nothing like the Emperor, and his ambitions won't push him to make any rushed or rash decisions. He's tactical and has a plan. One that involves finding a Dark Jedi no one seems to know about. Now, Luke and Leia are being hunted and while trying to outrun the aliens trying to capture them fall into other traps. I absolutely LOVED this book. It was fantastic! Like the movies, there are separate adventures going on at the same time. Sometimes they meet up, sometimes they don't, but everything is leading towards something REALLY BIG. 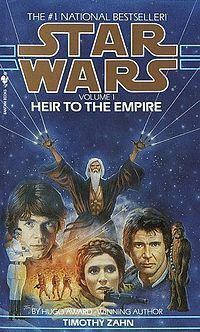 Like I mentioned above, I think that Timothy Zahn does a great job at capturing the general Star Wars tone and totally nails the characterisation. Everyone sounds, feels and acts as they should. While the new characters--Thrawn, Mara, Karrde--all add a new angle to this well-known, and much-loved universe. I also got a kick out of reading some of the most-quoted lines taken straight from the movies. There were a lot of exotic locations, but my favourite was Kashyyyk. I loved the lush descriptions of where the Wookiees live. Sounds dangerous, but also beautiful.